Herb Lester Oftens Suggests ‘Shopping Your Own Closet’. He’s Not Wrong. I was out East having coffee with my pal Herb Lester last week and noticed he was wearing what I thought was a pair of vintage double-soled Weejuns – those with the heft and solidity of the loafers worn by William Holden in that much republished image of him in NY. 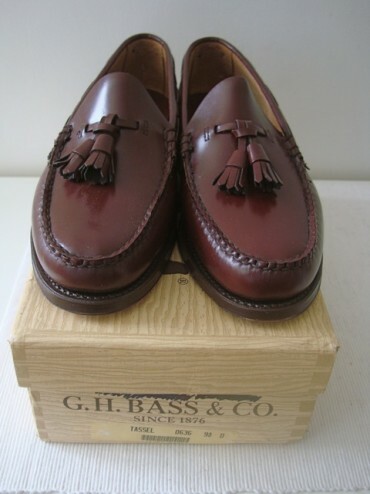 But no, this was a pair of the John Simons Rancourt loafers in burgundy. Now, I have them in the grain and they’re really comfortable and well made, but when I saw Herb’s burgundy pair I kicked myself for not getting them. I’d tried the burgundy on the day they first arrived in the store and Ivy cousin from LA, Fred, was wearing a pair on his last London visit so why did I not buy them at the time? Herb has a particularly good way of managing to make his various pairs of classic loafers look just the right side of beaten up – in a good way. I confess to have so many pairs of shoes (around 70 odd at last count) that it’s very hard for me to ever wear some of them in. The consequence is that my shoes often look too new, and therefore don’t get worn. A vicious circle. When I got back to Weejun HQ Herb’s shoes were still bugging me so did a google image search for the JSA Rancourt loafers – as you do. My eye was then caught by pair after pair of classic deadstock Weejuns, Dexters and other assorted pairs of loafing excellence. Where could I get my hands on these rare beauties, no doubt long sold on auction sites or fora? Wait a Minute – Those Are My Shoes! Then I realised that at least five of these images were of different pairs of shoes that I actually own and are sitting right now in boxes as I type this. Images in fact from The Weejun. Rare Wide Fitting Plastic Plug Era Tassel Weejuns. I have worn these a couple of times at least. What’s that all about? Shoes hidden away in boxes (especially seasonal ones like loafers) are never as attractive as that deadstock pair of Weejuns on Etsy or those Kenwoods in a rare colour or finish on eBay. Hard to find Dexter Penny Strap Loafers with Leather Sole. (JSA reference just coincidence). So, time to open some of those boxes, dust off the deadstocks and get wearing. Oh damn, it’s raining again. Well, another day then. Meanwhile, those burgundy JSA Rancourts are calling again.